This is a log for my ongoing Disposable Disciples of Bone Kingdom campaign. You can see the previous session HERE. A gambling hall and criminal network in Yun Hu. Currently under control of party, with Weeping Lotus managing it. They've absorbed many other sects into this organization including Crocodile Sect, Blades of the Weeping Lotus, Temple of the Jade Mercies, Relentless Corpse Sect and more. The party took care of business in Yun Hu, managing some loose ends of the sect. An official came to Stone Palace and announced that Bao Yang was to be arrested and brought in to speak with Royal Inspector Zhao Liu of the Bureau of Justice. Bao Yang refused to go without his retinue or weapons, so the official allowed him to take his weapons, and permitted his retinue to come provided they waited in the courtyard. He also said that Shen Chun was to appear before the Inspector as well. When they arrived at the inspector's hall, they saw he was a tall and powerful-looking man. He was not intimidated by the group's reputation and said that all he cared about was law and order. He could easily arrest and execute Bao Yang but doing so would definitely cost him men, and at the end of the day, he simply wanted order restored to the city. If Bao Yang would agree to help restore that order, he would not pursue his investigations of Treasury Inspector Qu's death or the death of the city magistrate. Bao Yang agreed and the party returned to Stone Palace. Meanwhile at eastgate, Chao waited outside an inn where he knew the house of paper shadows to be meeting. He trailed them when they left, following the agents to an encampment at the edge of town. There he killed a soldier in the camp, painted a mask of his face and donned his clothing. He then went to the central tent where Fearless Cat was insisting that the agents find Iron Temple and acquire the Thousand Painful Deaths flower. After issuing her commands and threatening dire consequences if they failed, she vanished in a trail of mist. Chao left the camp and headed north to Yun Hu. Back in Yun Hu, Bao Yang went to Master Zhao's and asked him to to look for any items or weapons of great power. Later that day, a box with a bloody map leading to Iron Temple arrived. Bao Yang investigated the matter and Master Zhao told him he had sent the box. He said Iron Temple was where the Thousand Painful Deaths Flower was located and that he his bandits had taken it from a merchant caravan (which explained the blood). Little Bai had a time when he returned to Stone Palace, as a trio of men, each missing a leg, were waiting for the opportunity to fight him. He wasn't very impressed but agreed to fight. The exchanged blows in the hall and Min started taking bets. It didn't take long for Little Bai to defeat them. The got to their knees and asked him to teach them his swordplay. He told them they would have to find his master. They said they wanted to learn from him. He said they were not very good, so he couldn't teach them. Then left. Around this time, Chao returned to the palace and reported what he knew to Bao Yang. He also went and met with Five Dagger Chang to finalize plans for their attack on the Jade Shipment. Flower Handed Snake returned to Stone Palace Sect with his retinue of flower maidens. Bao Yang told him to leave his weapons and people and come to the audience hall, but he refused. Bao Yang went personally with his men to insist on the matter. Flower Handed Snake made clear he had no respect for Bao Yang, saying he sent armies to handle babies and was a notoriously deceptive person. He would not put himself at such a disadvantage. Bao Yang suggested he change his tone, and Flower Handed Snake antagonized him further. "If you don't adjust your manner of speaking," Bao Yang said. "I will smash your head in with my mace." Flower Handed Snake said it would be a good thing to rid the world of a villain such as Iron Crab, so he was happy to fight. The two sides clashed. Little Bai landed several blade strikes on Flower Handed Snake. Flower Handed Snake assumed a meditate stance and unleashed a hail of bladed petals that cut Bao Yang and Chao. Chao interceded and said "There is no reason to fight. I respected your brother and we can work this out. Let's work together." Flower Handed Snake tentatively agreed to stop and the battle abated. Bao Yang told Flower Handed Snake he should listen next time and not be so outrageous. "Next time I won't be so easy on you," Said Flower Handed Snake. Again combat ensued briefly. This time they managed to knock out Flower Handed Snake. They tied him up and bound his disciples. When he woke, Bao Yang formed a deal with him. It took time, as Flower Handed Snake continued to hassle him. But they eventually agreed to go south together and deal with Southern Hill Sect, then face Fearless Cat for revenge over the death of Blue Handed Snake. That night they dined. Over the meal, Little Bai antagonized Flower Handed Snake, but he ignored his words and shifted topic. Before they left, Scholar Shen approached Little Bai and said he wanted to apologize and asked to be his chronicler. Little Bai allowed it but said that Shen would need to speak with the Sect leader, since he was pretty strict. Shen went to Bao Yang and formed an arrangement. They left and headed south with about 190 men plus their heroes. On their way to Twin-Fisted Eagle sect, they stopped at Songbird Villa to speak with Two-Timing Cockerel. They smoothed over concerns between the groups. Bao Yang said if they joined him, it would present an opportunity for a beautiful death (something he knew Two-Timing Cockerel was awaiting). He agreed to join, provided they let him fight Yellow Mantis one-on-one. Then they went to Twin-Fisted Eagle sect and allied with Twin-Fisted Eagle Clan. Together the group, now numbering about five hundred, crossed over the River of Swarming Beggars and went to the Singing Pavilion. Bao Yang took two long strips of paper writing "Surrender" on one and "Slaughter" on the other. He approached the five disciples of Southern Hill Sect drinking at the Pavilion and held up the papers. "I come here with two possible outcomes: Surrender and Slaughter; which do you pick?" Bao Yang's group butchered the men, then marched back to cross the river. As they approached they sensed men in the trees. When they got close to the bridge of the river, they saw hundreds of beggars, Nature Loving Monks, on the other side. To their south they also saw hundreds of Nature Loving Monks approaching. Bao Yang called out trying to negotiate. Someone shouted back that they would take his head. This was the sixth session of a new Wandering Heroes of Ogre Gate campaign. See the FIFTH SESSION LOG to read about the previous session. 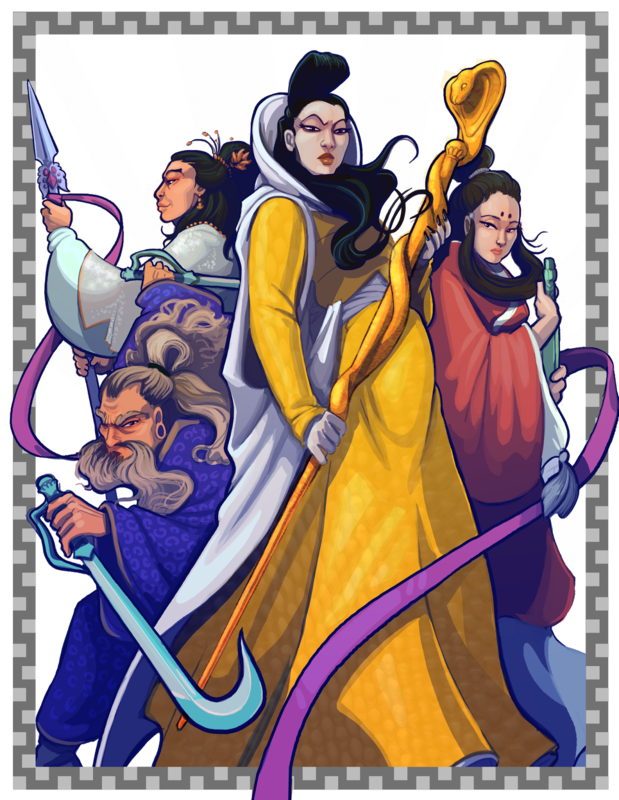 Wandering Heroes of Ogre Gate is our wuxia RPG. It is available HERE in PDF. It should be out in print in about a month. 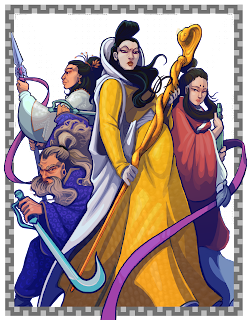 Peng Ke-Yen: Eccentric daughter of a merchant who goes against conventions and is notable for her white and black streaked hair. From Dashen village. Peng Pei: Daughter of two low Yen-Li priests. Also from Dashen village. Zhendao: A former slave of a man named Zhao. Shin Du: A performer and actor who is a perfect shot with the bow. Song Pei: A one-armed physician. The party made some arrangements in Yun Hu and prepared to leave for Iron Temple in Hai'an. Before leaving, Zhendao received a box containing a lock of hair and a note from Xu An. It read: "I am cutting ties, and forsaking any connection I have to Zhao Yi or the Daimyo. Please stop this senseless killing. I have wronged and will devote myself and my men to righteousness to make up for my crimes. We are heading south and departing from Hu Qin immediate. I have left The Vermillion Star to Yen Paramizu and the Daimyo’s men. Be warned he is still after you. All I know is they want your hands because of a connection to a fire pearl bed. But please don’t kill any more of my men." Song Pei went to the bank of Yun-Hu with the seal supplied by the city magistrate. There he made arrangements to place Master Xiao's 200 golden taels under an assumed name. He then bribed the chief of the bank with 2 Golden taels (worth about 20,000 spades). My Daimyo is pleased. He is also concerned. I don’t expect a mere pearl merchant to fully grasp the importance of our undertaking but the son of Shendo must be caught. You have failed to catch him. He is not a toy or instrument of revenge for you to amuse yourself with. With our help, your power has grown. Without it, you will wither and die. My Daimyo wants the hands of Shendo’s son. It does not matter if they are still attached to the body or not. Bring those hands to me or I will take your greedy, gold-stained hands as payment. Song Pei explained to Zhendao that the letter indicated they were after his hands for some reason. Zhendao decided to go back to Master Xiao's estate and cut off his hands. But he also left behind the letter from General Yamoshima to place the blame elsewhere. They then made their way south by land but it was still the Demon Moon and a dangerous time to travel. As they traveled both Zhendao and Peng Pei were plagued by nightmares of killing innocent people. They had trouble sleeping as a result. Coming upon a river, they decided to wade through to the other side. Ke-Yen went first and midway through she noticed a shape in the water. It moved suddenly and she leapt to the opposite shore. A Raksha Demon flew from the water and landed on her with its claws, digging into her flesh. The rest of the party flew or leapt over. Peng Pei presented both her Golden Raksha medallion and the paper talisman she was given and told the creature to back off. It bowed deeply and lowered its head. "I meant so harm. Please forgive me." It said. "Be gone," Peng Pei said. "Tell the Ghostly Emperor I meant no harm," it said and departed back into he water. That night Peng Pei and Zhendao dreamed of an illuminated figure with a tall bow made from a staff who said "Serve the ghostly emperor, become my disciple or become my instrument of death". In the morning they noticed one another's troubled states and talked about what the dreams might mean. They continued on. The Demon Moon was clearly powerful as they were soon ambushed by a Snake Demon in the Skinless Forest. It struck from the trees, taking Song Pei by the neck and pulling him up. There he gazed into its human-like eyes and fell in love. The create resembled a 40 foot long python. The party began its attack, failing at nearly every turn. It dropped Song Pei to the ground and lunged at the group, biting who it could. She assumed human form and got Song Pei in an Iron Clutch, draining him of life energy. Zhendao delivered two lethal stabs to her neck and she collapsed. Still in love, Song Pei became frantic to save her. Zhendao dragged Song Pei away and instructed Ke-Yen to slaughter the creature. Still in a rage, Ke-Yen dismembered the snake demon (much to Song Pei's horror). In the wake of the battle there was a great deal of chaos. Ke-Yen had used her Kung Fu recklessly and was overcome by Qi energy. A Swallow Qi Spirit possessed her and took over. The others did not realize the extent of her condition but noticed a sudden personality change. Song Pei attempted to gather the bloody remains of the Snake Demon and piece them together. He was intent on finding a master healer or Yen-Li ritual master to restore her. As Song Pei and Ke-Yen seemingly descended into madness, Peng Pei and Zhendao meditated. They focused on their Golden Raksha Medallions. Peng Pei succeeded in having a vision where the figure from their dream appeared. It said "Become my disciple or the medallion will weigh heavy upon you for sure." "How do we become your disciples," she asked. "Follow the signs. Follow the signs in the city. Meet the thirteenth chief." Zhendao attempted to communicate in the same manner and also had a vision. He said he would be its disciple if it gave him what he wanted. "Make me an assassin and I will serve you," he said. The figure in his mind fired an arrow at his chest. He awoke coughing up blood but otherwise unharmed. Zhendao flung his Golden Raksha Medallion into the woods, but it flew into the air and back around his neck. Song Pei continued to weep before the pile of dismembered remains. But Ke-Yen whispered in his ear that he should let her go. This seemed to move him and they continued on. As they traveled, it became clear the demon moon was certainly more potent than usual when Peng Pei spotted a curious fox in the distance. "You killed my sister," it said. "I will kill you for this." The fox flew toward them and assumed human form, attacking Peng Pei with her claws. Ke-Yen, who had been possessed by a Swallow Qi Spirit, whispered in the ear of the Fox Demon that she was mistaken and these people did not harm her sister. "Perhaps I was wrong, humans all look alike," said the Fox Demon. Then she flew off. The party continued on, finally reaching the Iron Hills. They spotted a homestead and approached. An old woman greeted them and offered them shelter. Inside she had garments with all kinds of patterns and colors. She offered to sell them some and they each bought items from her. She was very particular about what they could buy but otherwise seemed nice. When she learned some of them were wounded, she healed them with Plum Blossom Palm technique. When they told her their goal was the Thousand Painful Deaths Flower at the Iron Temple, she informed them the place was haunted by the spirit of a powerful master who had slaughtered the temples' nuns sixty years ago. She told them if they were hurt in their effort to return to her and she would heal them again. They also discovered that Ke-Yen was possessed and the old woman told them to go to a city to find someone capable of purging the spirit before it was too late. The spirit possessing Ke-Yen revealed her name was Chen Ying. In the morning they left for the temple and reached it. They climbed the steps and found a hanging temple built into he face of a cliffside. They went into temple and found a long hall with many statues. Their exploration eventually brought them to a chamber filled with figures on the wall performing different sword techniques. They took this to be a manual so Zhendao started practicing the moves. Then they heard a voice "Who dares to steal my Thousand Painful Deaths Flower?" A a spectral figure with red robes and a faded face appeared before them and threatened to annihilate the party if it didn't leave. Song Pei stammered a response, trying to explain they could help it achieve its goals. He asked what the ghost wanted. "I want the survivor who got away, I want Jade Maiden," he said. "Bring me Jade Maiden and I will give you the Thousand Painful Deaths Flower." They were unsure who the Jade Maiden was, and the entity lead them into a records hall with a wooden scroll pinned by a dagger to the wall. It said that Shang Si had attacked the temple and killed the nuns with the thousand painful deaths flower. It was clearly the work of the surviving disciple who also announced she would go into he world and destroy all the artifacts and weapons that bring death. Still unsure who she was exactly, Song Pei pressed for more details. But this angered the spirit. He threw up his hands and an explosion of fire engulfed Song Pei. He used Mountain in the Flood to withstand the attack. "Leave her and find her or I will kill you next time I see you," it said. Ke-Yen, possessed, assumed bird form and became invisible, then explored the chambers of the temple while the party dealt with Shang Si. She came to a room with a state of a woman named Granny Wind. There was a pool in the room and a set of doors. She opened the doors, still invisible, and it revealed a long hall. At the end of the hall a decaying abbess sat upon a cushion with her hand on her knee. "Shang Si you cruel devil," She said. Ke-Yen flew down the hall and found a door. She opened the door and went in. There she found four desiccated corpses writhing toward the ceiling. They turned to look at her with pain filled expressions. She immediately fled. Song Pei and the others heard the abbess shouting Shang Si's name and he went to investigate. He saw the abbess, saw that her face was rotting, and fled. As he did so, she chased him. He said that he would help her deal with Shang Si. This calmed her down. They spoke and she told him that to kill Shang Si, they must immerse his remains in water and lay him to rest. 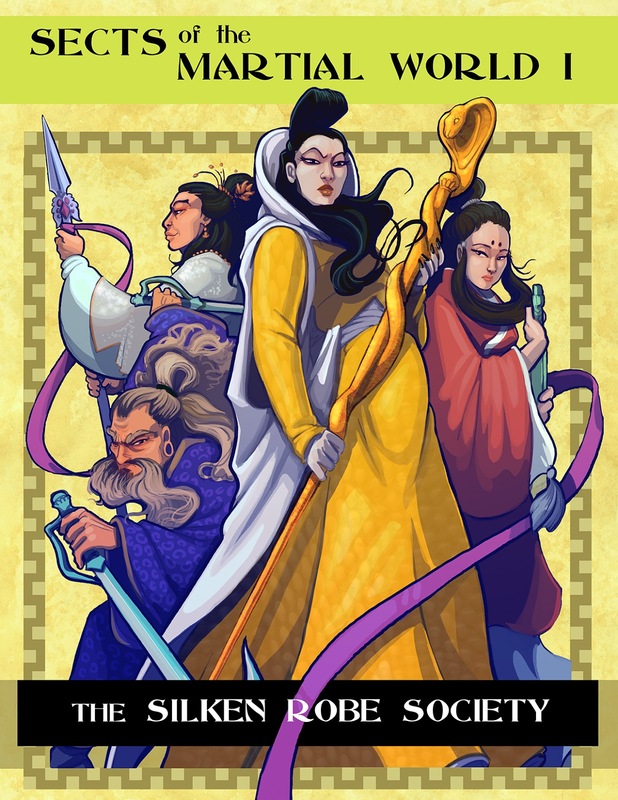 The rest of the party crept toward them from around the corner and when Peng Pei approached, the abbess became suddenly suspicious, accusing them of working with Shang Si. After a time Song Pei calmed her and assured her they meant to kill Shang Si. She informed him that they should go down the western hall to the old tomb where they'd find his bones. They went deep into the old tomb and after some amount of challenge, reached a dead end where bones and tattered red robes were on the ground. As they picked up the bones they heard Shang Si from down the hall saying "Who dares pick up my remains?" They went into the tomb chamber to confront him, while Peng Pei started filling a stone coffin with water using her Water Spirit technique.